Welcome back to Mike of the Mesozoic! 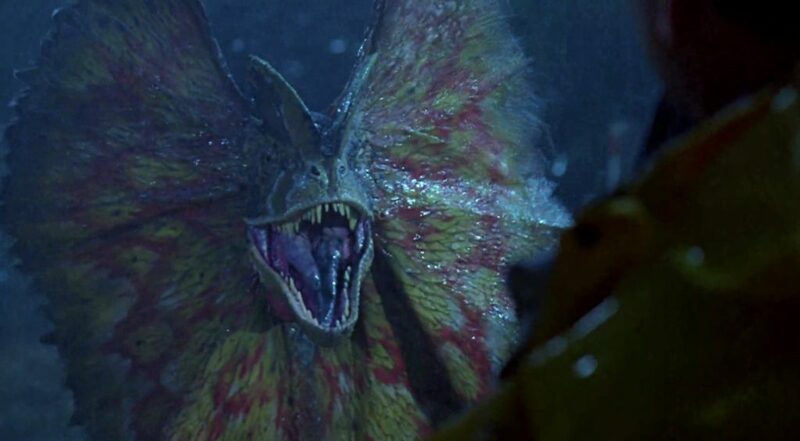 In today’s article, I’m going to continue my series affectionately analysing the science of the dinosaur depictions in the original Jurassic Park movie and get to talking about what is probably one of the most misunderstood dinosaurs in the world: Dilophosaurus. Crichton then goes on to explain that the park management had tried unsuccessfully to locate and remove the dinosaur’s venom sacs, and that nobody would be able to figure it out until they had an opportunity to autopsy a deceased animal. 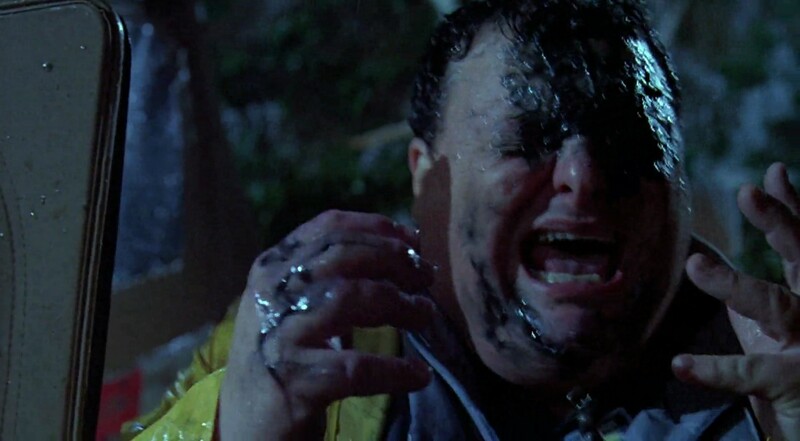 The novel Dilophosaurus is essentially an elaborate metaphor for the folly of attempting this kind of scientific control, and it seems reasonable to interpret the dinosaur’s expanding frill in the movie – which pretty much appears from nowhere, taking both Nedry and the audience by surprise – as a visual, cinematic translation of this metaphor. So I understand the perfectly valid artistic reasons for wanting to do this. On the other hand, it does then raise some questions about animal behaviour. Frilled lizards, the nearest obvious inspiration, use their expanding neck frill when frightened in an attempt to appear larger, but not whilst killing prey – it’s strictly a defensive behaviour they exhibit whilst stressed. I’m not sure why a predatory animal would go to the trouble of doing a scary performance for the benefit of the thing it’s about to eat. Cobras, too, can display a hood and spit venom (often aiming for the eyes of their attacker), but again, this is a defensive move as a response to a threat, not predation behaviour. As the Dilophosaurus spends a lot of time standing directly in front of Nedry, out in the open, regarding him curiously, we can probably assume that it isn’t afraid of him, and doesn’t feel particularly threatened. So what would be the function of a threat display in the context of a normal predation event? As far as Dilophosaurus being able to spit venom goes, this, too, is all fiction; but the only actual exposition about the dinosaur in the movie isn’t exactly transparent about the veracity. Apart from the misuse of the word “poisonous”, the problem here is that for a lay audience, it isn’t clear whether this revelation has been made only in the context of the movie, or the actual real world. 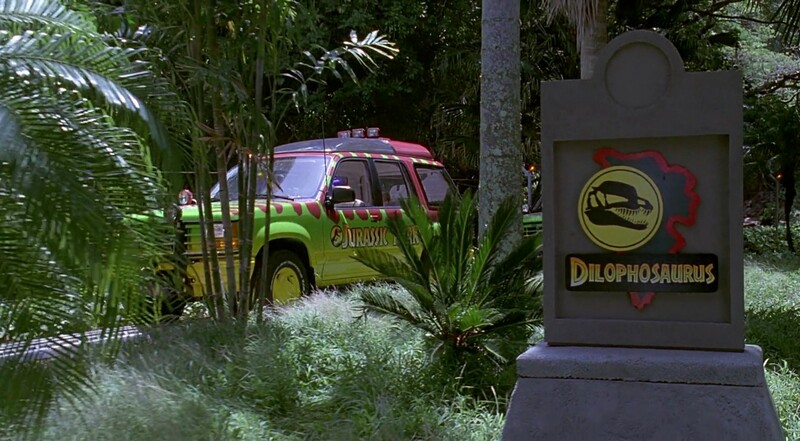 “We now know Dilophosaurus is actually poisonous.” Do we? No wonder there’s so much confusion about how this animal should appear. So – all that having been said – let’s get onto how the animal should actually look. 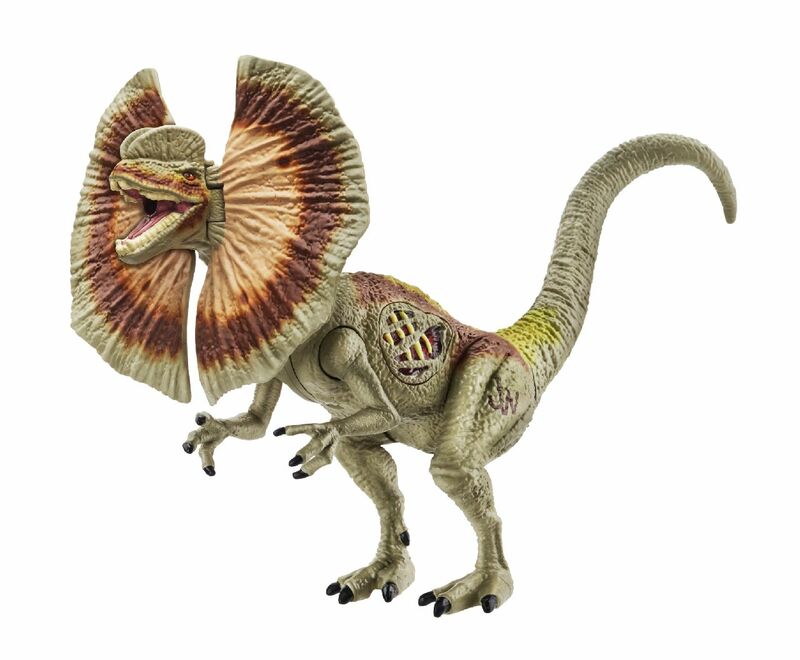 First of all, the movie Dilophosaurus is too small, although we don’t necessarily have to consider that an inaccuracy as such, as it could easily be a juvenile. I would expect the dinosaur’s head to be about level with Nedry’s head or shoulders if fully grown, perhaps taller (and it is of course true that we can’t be exactly sure what is the upper limit on a dinosaur’s size – it may well be that they could get larger than the specimens we’ve found so far). 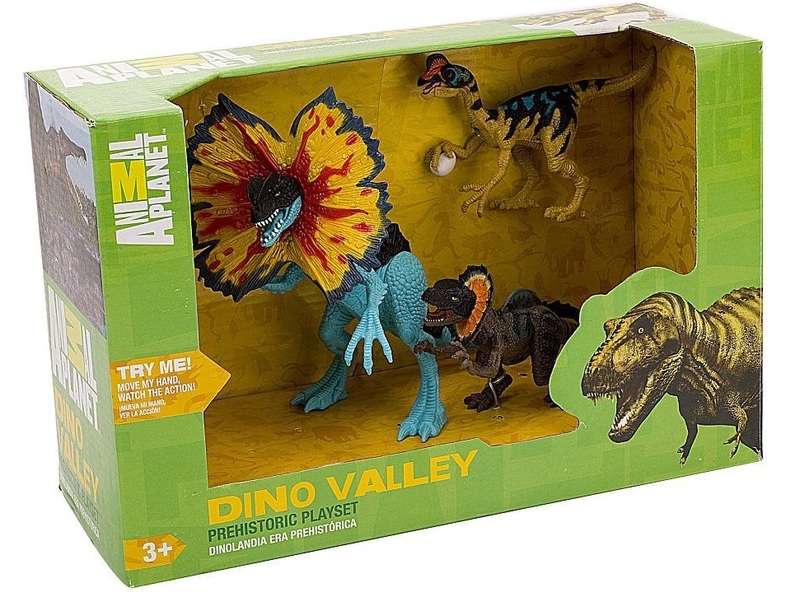 I believe the animal’s size was changed so that it would be more distinct from the Velociraptor depictions in the movie, and that’s fair enough. 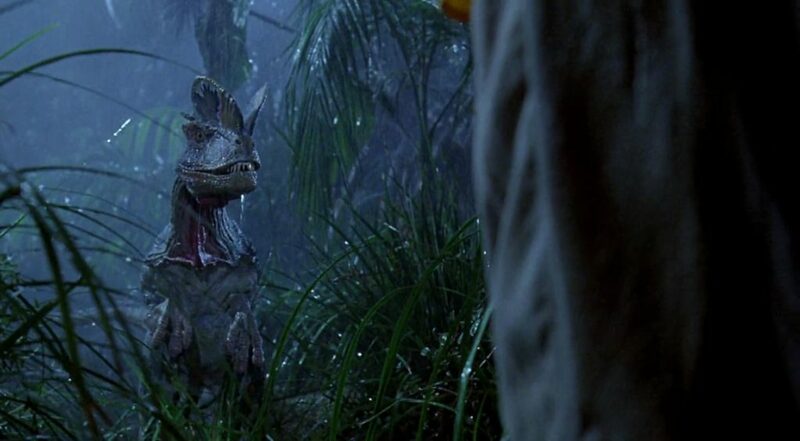 Something I do have a problem with in Jurassic Park, though, is that changes have been made to Dilophosaurus that don’t seem to have been motivated by storytelling concerns at all, and which remove some things that make the animal interesting. 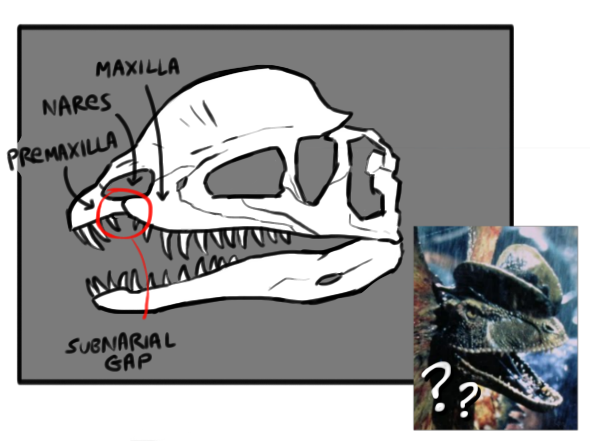 The jaws of Dilophosaurus in particular are very distinctive, with a striking snaggle-toothed ‘notch’ (called a subnarial gap) where the maxilla and premaxilla bones meet beneath the nares (nostrils), resulting in quite a sizeable diastema (tooth gap). The movie, on the other hand, seems to have opted for generic “raptor”-style jaws, and I’m not entirely sure why. If I remember correctly Crichton only got the idea for venom-spitting in the first place because he thought the animal’s jaws might be too weak for regular predation, so communicating that visually might have actually been nice, although it seems likely that Dilophosaurus may have done just fine with capturing and eating large prey in a normal fashion (and there is a theory now that it may have been a fish-eater, which seems reasonably likely, we think, as some other piscovorous dinosaurs have jaws and nostrils not dissimilar to this). 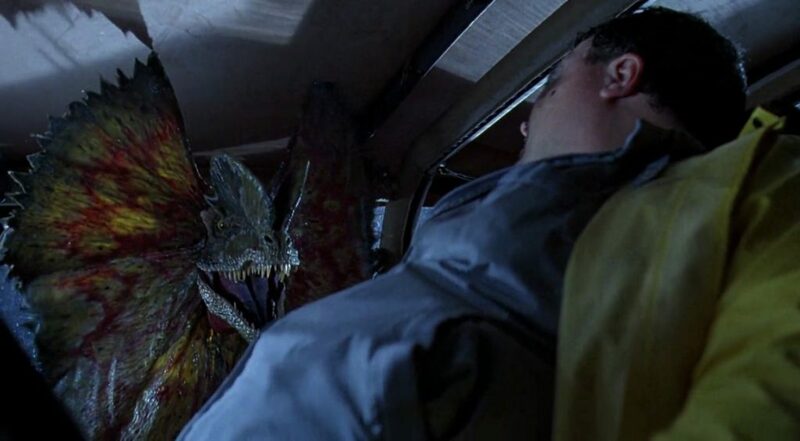 Oddly enough, though, the very last shot of the Dilophosaurus in the film, in which it corners and snarls at Nedry in the Jeep, is quite striking, as it makes the animal’s jaws suddenly seem much closer to what they ought to be. The movie Dilophosaurus has much more pronounced crests than the real animal; whereas they ought to be graceful half-moon sweeps backward from the nasal bones to meet the lacrimals, the film animal looks like it’s had a pair of sandals glued onto its head. They did at least get the “finger-like” projections at the back of the crests right, albeit a little exaggerated, and they do have the crests coming together correctly over the nose, so that at least is good. The animal’s general proportions, despite everything else, are actually pretty okay – Dilophosaurus did indeed have quite a long neck and long arms (although, as with all of Jurassic Park‘s theropods, and as stated in an earlier post, the dinosaur’s palms should be rotated to face inwards, not pointing down at the floor, as this is anatomically impossible). Its hands are too big and chunky, though, and seem to only have three fingers – there should be a small, reduced fourth claw visible. Those ribs are a bit worrying. Is it malnourished? 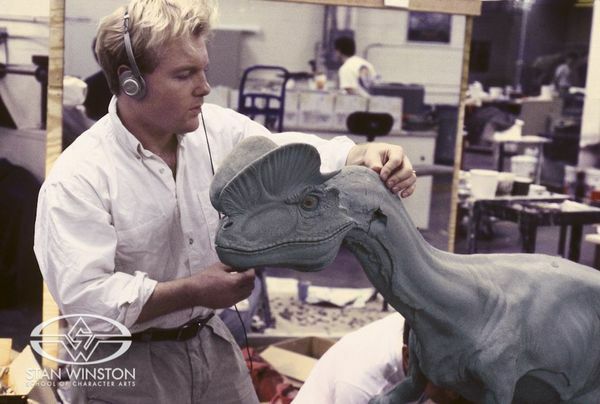 That’s about all I wanted to say about Jurassic Park‘s Dilophosaurus! 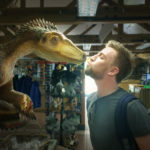 I feel as though I’ve been quite critical today – Dilophosaurus is by far the worst dinosaur depiction in an otherwise very respectable movie, and whilst I’ve tried to be fair, and not unnecessarily scathing, I do feel the need to balance out the end of this article with a little positivity. 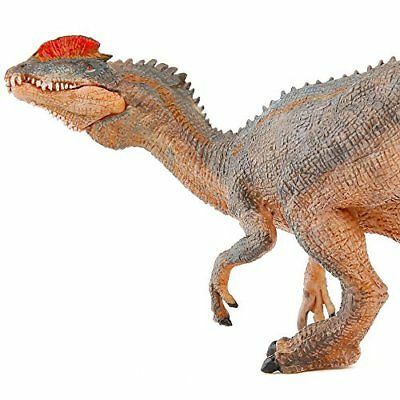 So, having complained about gross binosaur toys at the beginning of the post, it only seems fair to mention that some toy companies, most notably Schleich and Papo (pictured below), have been pretty good about putting out some nice, not-JP-influenced Dilophosaurus figures. So, a round of applause for those companies! We appreciate you. Thank you for reading! 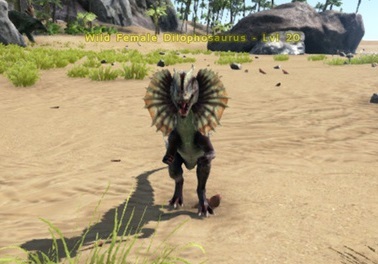 As ever, if you have any thoughts about the movie, Dilophosaurus, or my analysis thereof, please leave them in the comments below! Just one small correction, the Dilophosaurs in the book are described as being the correct size and the frill is not mentioned. That was invented for the film. 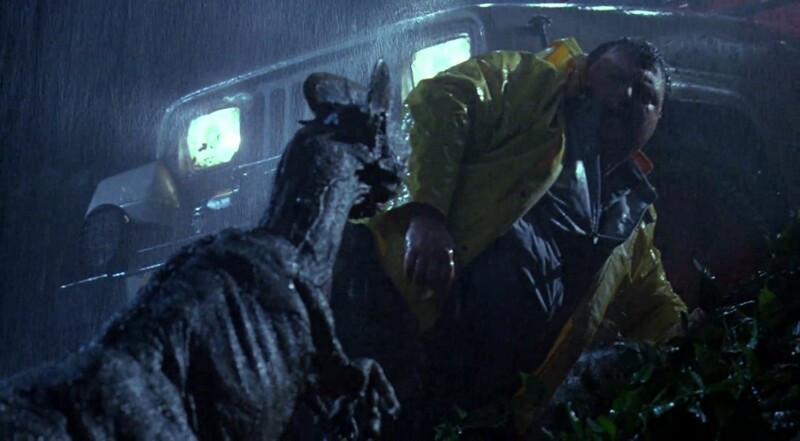 Side note: there is an interesting error later in the book: Dilophosaurus was not one of the animals with frog DNA, but Grant and the kids run into a pair in the midst of a mating ritual. Hello! 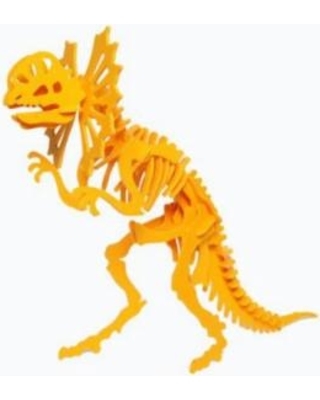 Not really a correction – I didn’t comment on the accuracy of the book’s version of Dilophosaurus at all – but thank you for the extra information! This series is very entertaining! Thank you for taking the time for readers like me! !